Cramming all four parks into a two trip to Disney World was no easy feat. We knew it would mean long days and that there was a good chance we would not get to do everything we wanted. I asked everyone what they really wanted to do so we could plan around that. Emma asked for the Peter Pan ride, Davis asked for Seven Dwarves Mine Train, and Tyler wanted to see Tinkerbell. All Magic Kingdom. We decided to break our days into Animal Kingdom and Hollywood Studios on one day (and we ended up adding in Epcot!) and Magic Kingdom the next, giving us plenty of time to get the three things we wanted in Magic Kingdom. 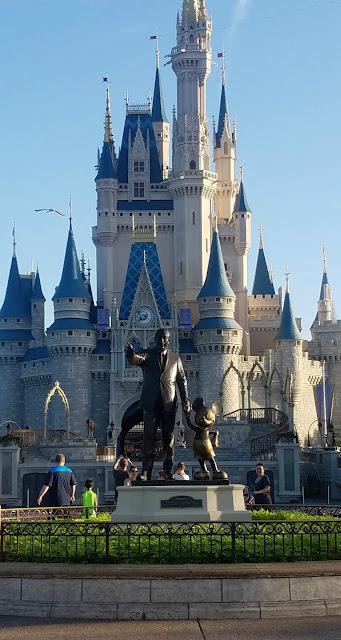 While looking at Magic Kingdom things and planning our day, I came across the Disney Early Morning Magic, which is different than the Extra Magic Hours available to resort guests. Early Magic Hours get you into a park 1 hour early on certain days and is free to hotel guests. Early Morning Magic is a ticketed event (that costs additional money) that gets you into Magic Kingdom at 7:45 am when the park opens at 9 am. You have access to Seven Dwarves Mine Train, the Winnie the Pooh Ride, the Peter Pan ride, and includes a buffet breakfast at Pinocchio Village Haus. When I looked, there were no tickets available. A couple weeks later, because I was checking religiously, it was available! I grabbed 4 tickets and because I was curious, I continued to check it and it never came back up as available. On our Magic Kingdom day, we were up early and at the Pop Century Magic Kingdom bus stop at 6:35. The bus came at 6:39 and brought us to Magic Kingdom. 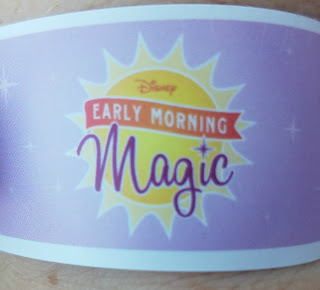 AT 7:10, we were given our special Early Morning magic band, that allowed us on the rides, while people who had early meal reservations were only allowed to go to their meal. At 7:35 they opened the gates and let us in. It was very cool seeing so few people in front of the castle and we stopped to have a picture taken. Then it was right off to Peter Pan. Emma had been asking to ride it or weeks and since we werent able to ride it last time we went, it was a first for us. Imagine my disapointment when they said it was down but they'd open up small world for us... not exactly the same, so we went to Seven Dwarves Mine Train. It's Dave's favorite and since I'm afraid of rollercoasters, I offered to do the Winnie the Pooh ride with the kids. Emma wanted to try the rollercoaster and since there was no long line to wait, we figured it was worth it. Emma and Dave went to the ride and Tyler and I went on Pooh. When Tyler and I got off the ride, Emma informed me that she loved Seven Dwarves so much they did it twice and she really wanted me to ride. I hate rollercoasters, like hate them. I can barely even ride the little kid caterpillar ones, or go on the flying swings without my stomach doing flips so no, I don't want to ride the Seven Dwarves, but Emma wanted me to, and there was no long line to wait in, so really, I had to try it right? I'm not ashamed to say Emma held my arm the whole time but it wasn't terrible. I didn't exactly like it but I didn't hate it either. And since now both Tyler and Emma loved it and wanted to keep riding, I didn't really have a choice since each row was only 2 people and the kids needed someone next to them. I ended up riding it 5 times total, which was nothing compared to the 8 times Emma rode and the 10 times David rode! With a wait time of over 2 hours during normal operating hours, that was crazy! It absolutely made the ticket price worth it! We took a family ride on the Carousel and Winnie the Pooh before heading towards Peter Pan to see if it had opened. Sad face- it hadn't, so we went for breakfast at Pinocchio Village Haus. The buffet was wonderful - eggs, french toast, bacon, sausage, and Mickey waffles! There was yogurt and fresh fruit alongside a juice bar. Because it was a buffet we were able to eat as much as we wanted, even if it was a plate of bacon for Tyler, and we had access to it until 10 am, even after the park opened. While the initial price was a bit to stomach, I'm so glad we took advantage of it since t gave us the opportunity to ride Seven Dwarves so many times, which ended up being my kids favorite ride of the day! 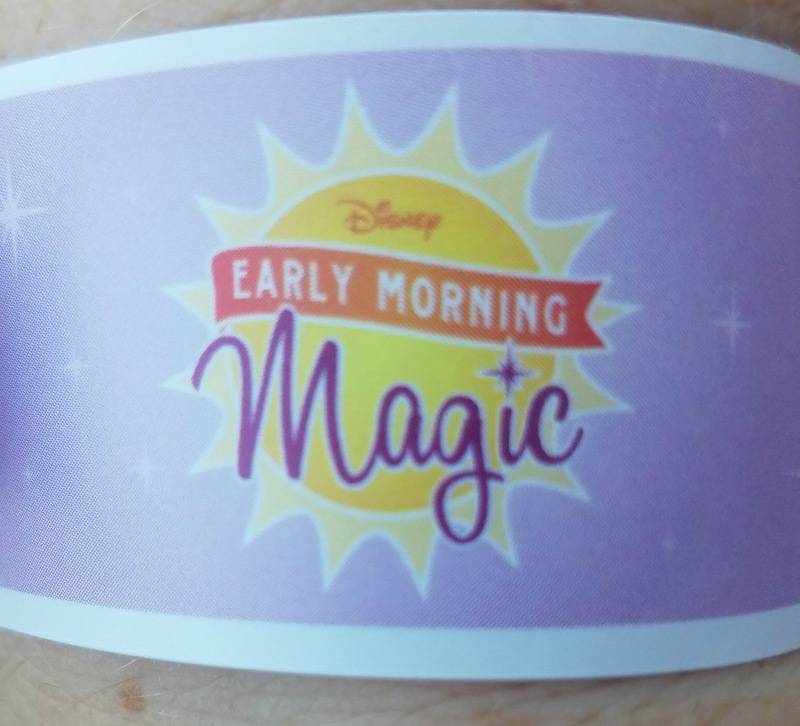 We'll definitely plan our next Magic Kingdom day to have Early Morning Magic if we can! 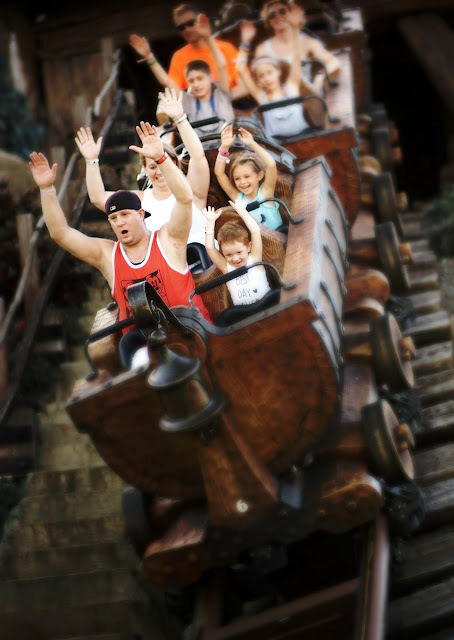 Would you spend the money to be able to ride Seven Dwarves Mine Train 10 times? 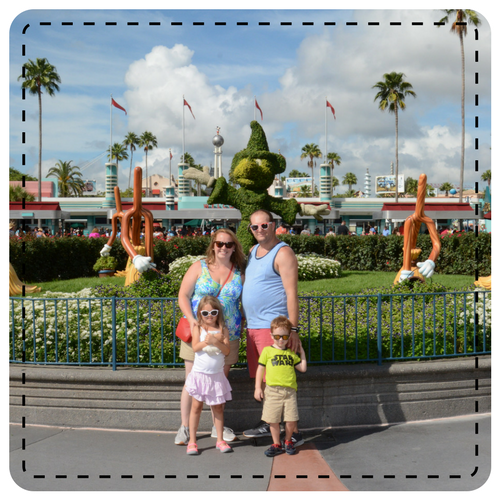 We're home from our whirlwind trip to Disney World this week and it was absolutely amazing! We really wanted to make the most of our short trip so we added in a few extras to really up the magic! Our second night there, we went to the Hollywood Studios Star Wars Dessert Party. 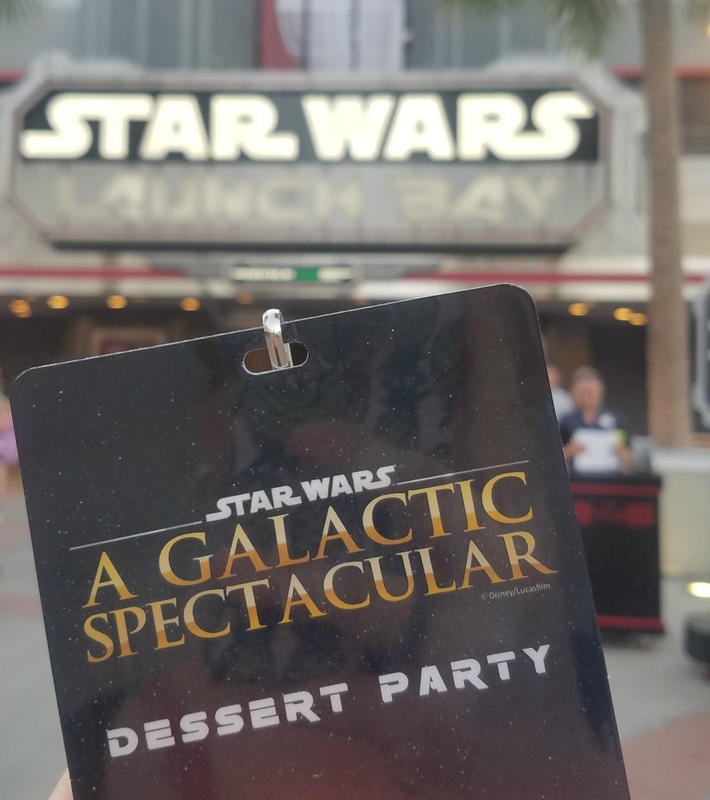 Hollywood Studios has had a huge focus on Star Wars (while they build Star Wars - Galaxy's End, rumored to open in 2019) with stage shows, meet and greets, and even a special night time fireworks show. Knowing how much Tyler loves Star Wars, we were able to get 4 passes for the dessert party. The party itself takes place in the launch bay and while it appears that it's shut down to outsiders, the character meet and greets were not, so unfortunately a 45 minute wait for Chewbacca during a 1 hour party didn't make much sense. 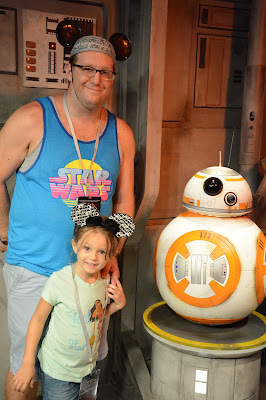 BB-8 was only 10 minutes so we did get to meet him, however, if I had known that it was open to everyone, we would have made time during the day to meet Chewie and Kylo Ren. Thankfully, we saw them earlier at a stage show, so Tyler wasn't too upset when we redirected him to the treats that were offered. Speaking of treats, there were so many! Delicious themed cupcakes, Emma especially loved the chocolate rocks on the BB-8 cupcakes, and sugar cookies. My favorites were the alcoholic themed drinks and the freeze dried nutella, but a close runner up with the Ice cream station with "Mickey dirt"- so delicious! They also had skewers of grapes, cheese, tomatoes, and hummus if you preferred savory items. The kids loaded up plates and we found a spot in the launch bay to eat. They, with all the other kids, were running around crazy, but the cast members didn't seem to mind. At 8:45, about 15 minutes before the fireworks, Tyler fell asleep. Just slumped over and went to bed. 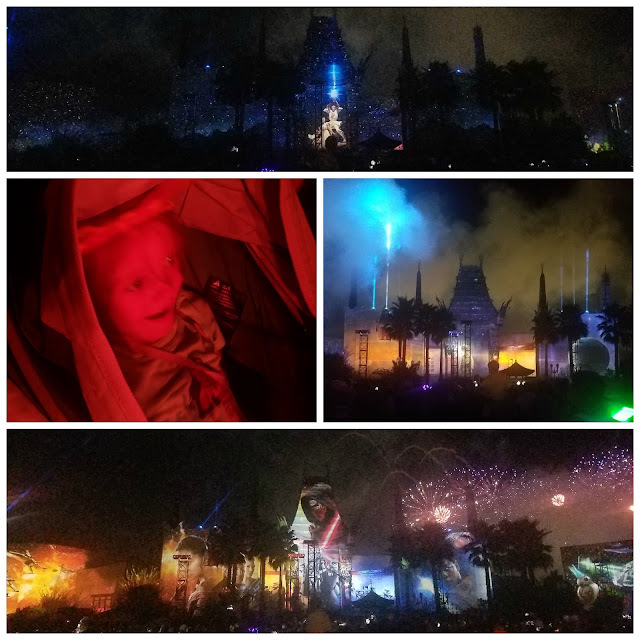 I carried him out to the stroller to let him lay down and when I turned around, a Storm Trooper was leading the whole party to our reserved fireworks viewing spot so I hopped into line and got right in the front of our special viewing area! The show itself was very cool-- integrating images and audio from all of the Star Wars movies and coupling them with fireworks. Emma loved the show and Tyler woke up for the last 5 minutes. After the lights came up, I noticed that everyone else in our dessert area was carrying a bag and I remembered that our tickets were supposed to come with a Chewbacca mug to take home. We asked an employee when they had been given and was told that they were passed out as people exited the Launch Bay (when I was already outside with a sleeping boy) but they found a few other employees who took our information and told us they would mail them to the house so we're anxiously watching the mail! 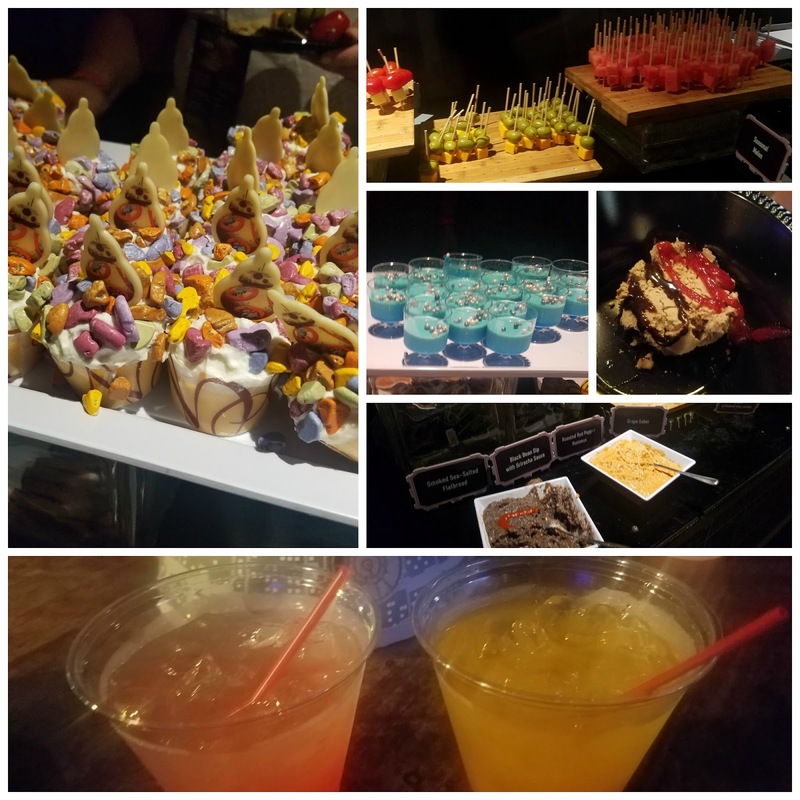 Overall, we enjoyed the party but I'd personally love it if Disney created a Fastpass type line for Character meets during the party so that we didn't have to choose between meeting the characters and enjoying the desserts. Have you been? Or are you interested in attending? 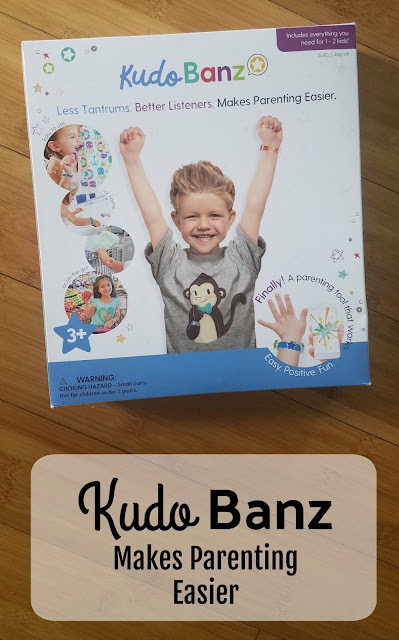 I'm always excited for new toys-- sometimes even more so than my kids and Blip recently released two toy lines that I just LOVE! 1. 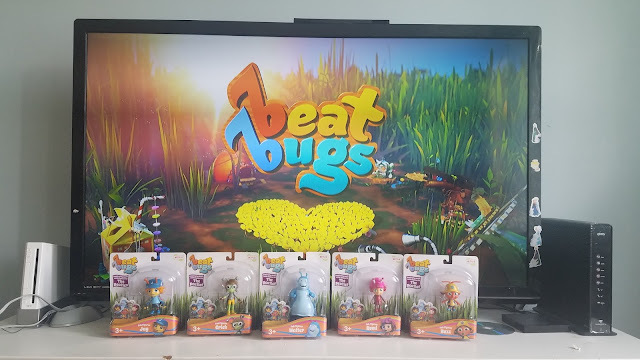 The Beat Bugs toys! Have you heard of the Beat Bugs yet? The Beat Bugs are these adorable little bugs that are inspired by the music of the Beatles. The animated cartoon is on Netflix and Tyler loves it! The music is redone by some of today's most popular artists (like Sia and P!nk!) and it's a great show to dance along to. I was super excited to find some of the bug toy figures at Target last week. Since Emma loves doing her videos now, she insisted on setting up all the bugs in front of the show! Any toys or tv that inspires a love of music, and plays good music for mom to clean to while they watch an episode, is good in my book! The toys themselves are exclusive to Target stores, and the show is only on Netflix but you have to check them out if you haven't yet! Emmalee loves dolls. 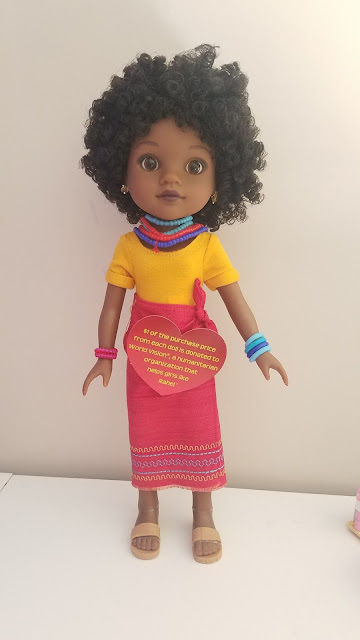 Doesn't matter if it's American Girl 18" dolls, Our Generation clothes, and accessories, or the new American Girl 14" Wellie Wishers, she loves dolls. We were introduced to the Heart for Hearts Girls through Blip toys after Blogger Bash and I fell in love too! For every doll sold, Hearts For Hearts Girls makes a $1 donation to their charitable partner, World Vision, a global humanitarian organization that supports children through local programs. Whether it’s malaria nets in Africa, schoolbooks in Asia, or food supplies in the US, these programs help kids to thrive and succeed. 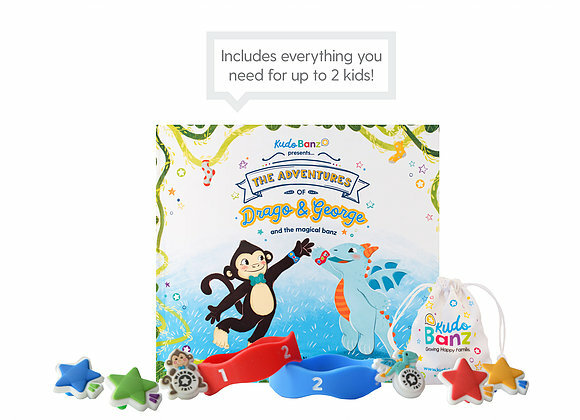 How great is it to find a toy that my child loves that also has an important backstory and supports a great cause. There are currently four girls: Rahel from Ethiopia, Dell from the USA, Consuelo from Mexico, and Nahji from India. 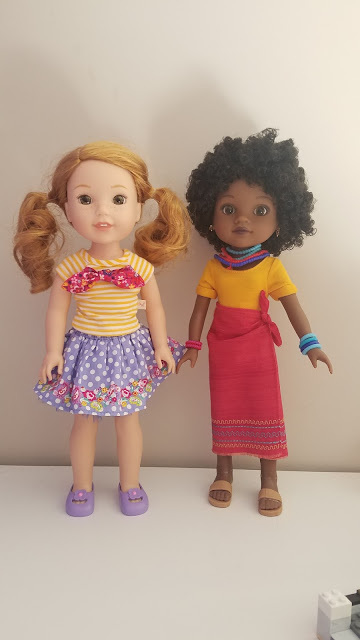 Emmalee was lucky enough to be sent Rahel and she instantly joined Emma's other 14" dolls, as well as the 18" ones she has. American Girl Wellie Wisher on the left and Rahel on the right. You can purchase the dolls at Target and other major retailers. I love that the Heart for Heart Girls have a great price point (currently $39.99 at Target) and do good for others when I buy them for my girl. I can't wait to add a few more to her collection this holiday season! 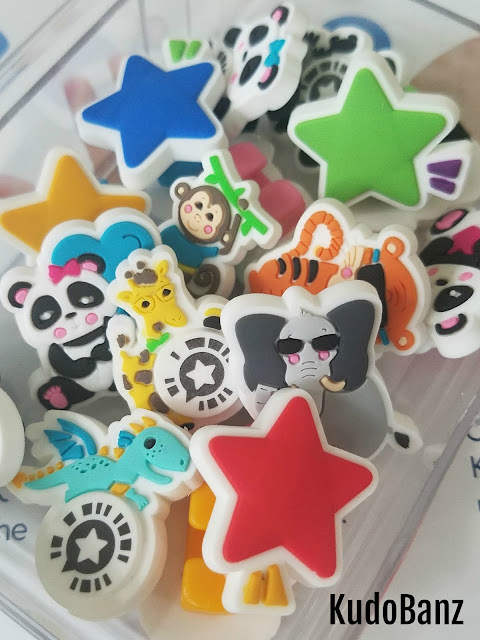 Do you prefer the Beat Bugs or the Heart to Heart Dolls? Going back to school is always a difficult time for me. Not because I don't want to go back, but because I'm torn about going back. As a teacher, I love my job and my students. I love the impact I can make on them, but as a mom, it's hard for me to go from spending all day with kids in the summer to only having about 4 hours with them each night. However, I know how important their education is, and how important of a role I play in my students, so there is always some excitement for me! The thing that I dislike most about going back to school,. is the posts from other parents about going back to school on social media. On any given day, I see at least 2 parents say they cannot wait for their kids to go back so they have free time again, and twice that complain about how much it costs to go back to school, after buying all new school supplies at the beginning of the year. According to Kids In Need Foundation, students who go without the school supplies they need struggle with self-esteem and perform worse in school than students with adequate supplies. Scotties knows this and wants to make it better. Every child, no matter what their circumstances, should have the supplies they need to help them be engaged in learning. Pencils, crayons and paper may seem inconsequential to the learning process, but for a child in need, they can make a world of difference. Scotties has made a 1 to 1 Promise to make sure kids have what they need this school year! You can check out lots of other #ReadySetSchool videos on Scotties Facebook, Twitter, and Instagram accounts and be sure to make your own while you're there! 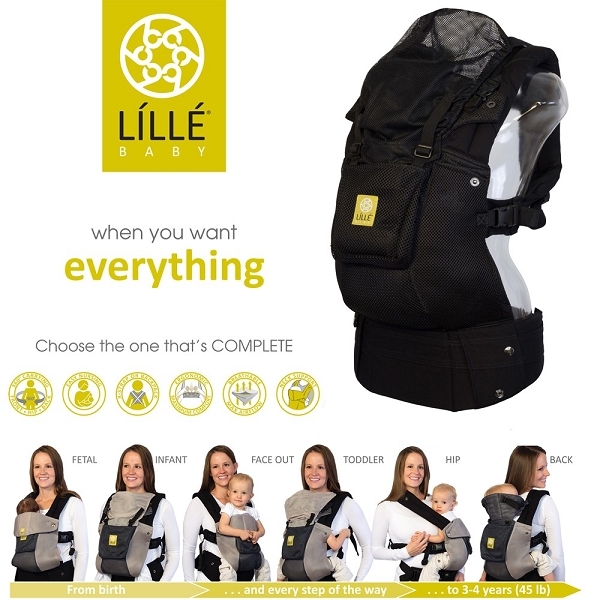 What would you pack in a backpack for a kid who was having a tough day at school? We were provided these ears in exchange fr our post, however, we searched them out because we loved them so much! All thoughts and opinions are our own. 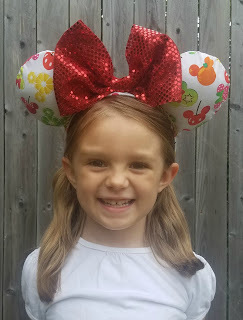 Seriously, one of the best parts of a trip to Disney are the EARS! 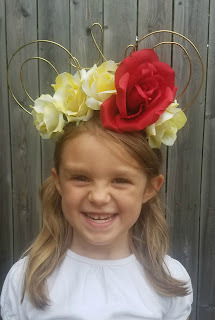 I love the creative Disney ears that I see all over the parks and while Disney Store offers lots of great ones, I am always amazed at what I can find being handmade and on Etsy. I'm excited to highlight a few of my favorites! Seriously, how gorgeous are these flower ears?! I'm obsessed. I had reached out to Morgan, the owner, asking for a Beauty and the Beast inspired floral set and I was in love with what she came back with! I might be biased since I love Morgan anyways-- she's a former student and now my son's teacher!-- but the attention to detail in these is just amazing. Emmalee has already asked if she can steal them from me but I have plans to wear these both days in the park- they'll match every theme I'm going for! And the best part, only $19.99 plus shipping. Wicked Good Ears is run by Ally, a New England native turned Atlanta transplant, and lover of all things Disney. 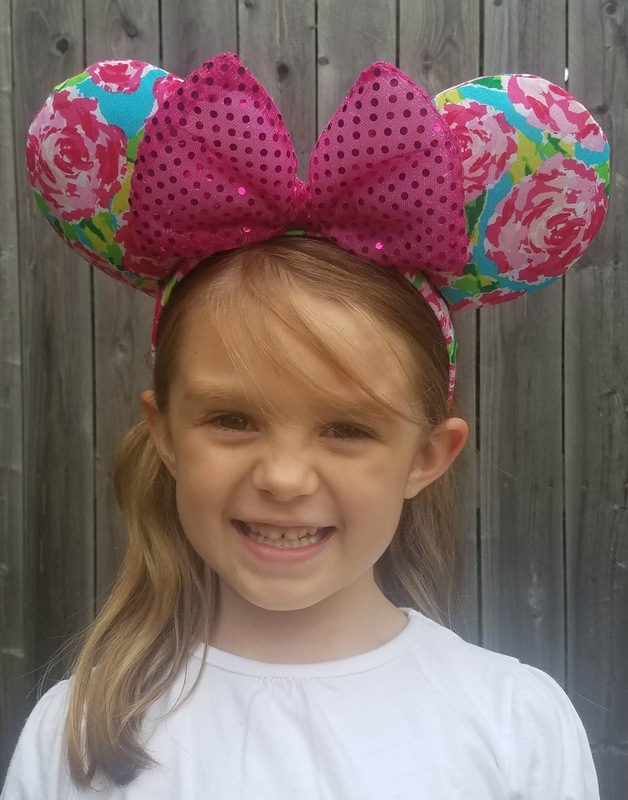 The shop just opened in July, but she is excited to bring a high quality and durable product to Disney fans with new styles coming every week! Ally made these gorgeous Lilly inspired ears when I told her how excited I was to check out Disney Spring's Lilly Pulitzer store. 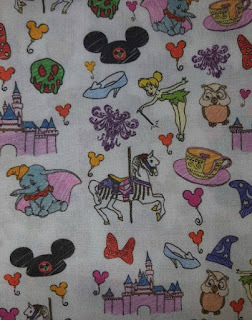 I'm making Emma a matching short to wear since I know she'll end up stealing my "Lilly Pumitzer" inspired ears! 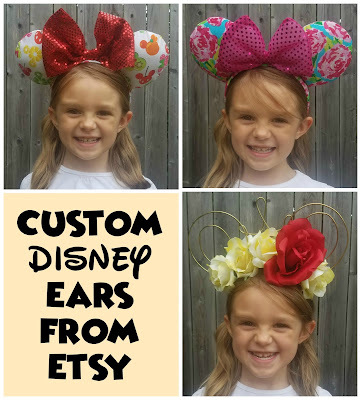 At only $25 with free shipping, you need to grab a pair of her handmade ears! When I was on Etsy looking at ears, Emma came up behind and shouted (right in my ear!) "Mom, I neeeeeeeed those fruit ones when I go to Disney!" Her obsession of fruit and my love of Dole Whips equal the perfect set of ears for Aloha Isle, and every where else that's bright and fun! She also just started making matching pocket shirts to go with her ears, which is super helpful when outfit planning. Shirts start at just $13 and ears range from $20-$28. And I can I say I'm obsessed with her? Whe I told her how much Emmalee loved them, she included matching bow! Great customer service that goes above and beyond always gets my vote (or money). We all know how obsessed I am with the Dooney and Bourke Sketch pattern, right? I mean, I even decked out my Magic Band with the pattern so I was beside myself when I saw this fabric that looks so similar! While I don't have the ears yet, I wanted to share this page because I'm obsessed with her as a seller and her customer service. I reached out to her just before her move and when things got crazy during her move, instead of ignoring me, she kept open, constant communication. That alone makes me want to scream her name from the rooftops. Good customer service is hard to come by. I can not wait until they arrive!